Minsmere is a place in the English county of Suffolk. It is located on the North Sea coast around 3.5 miles (5.6 km) north of Leiston and 1.5 miles (2.4 km) south-east of Westleton within the Suffolk Coast and Heaths AONB. It is the site of the Minsmere RSPB reserve and the original site of Leiston Abbey. A heath is a shrubland habitat found mainly on free-draining infertile, acidic soils and is characterised by open, low-growing woody vegetation. Moorland is generally related to high-ground heaths with—especially in Great Britain—a cooler and damper climate. The Eurasian bittern or great bittern is a wading bird in the bittern subfamily (Botaurinae) of the heron family Ardeidae. There are two subspecies, the northern race breeding in parts of Europe and Asia, as well as on the northern coast of Africa, while the southern race is endemic to parts of southern Africa. It is a secretive bird, seldom seen in the open as it prefers to skulk in reed beds and thick vegetation near water bodies. Its presence is apparent in the spring, when the booming call of the male during the breeding season can be heard. It feeds on fish, small mammals, fledgling birds, amphibians, crustaceans and insects. The Eurasian stone curlew, Eurasian thick-knee, or simply stone-curlew is a northern species of the Burhinidae (stone-curlew) bird family. A bird hide is a shelter, often camouflaged, that is used to observe wildlife, especially birds, at close quarters. Although hides or hunting blinds were once built chiefly as hunting aids, they are now commonly found in parks and wetlands for the use of birdwatchers, ornithologists and other observers who do not want to disturb wildlife as it is being observed. Minsmere River is a river in the English county of Suffolk which flows into the North Sea at Minsmere. The river is formed from the River Yox at Yoxford before flowing through Middleton, Eastbridge and Minsmere. It flows to the south of Minsmere RSPB reserve helping to form many of the wetland habitats at the reserve. Marine clay is a type of clay found in coastal regions around the world. In the northern, deglaciated regions, it can sometimes be quick clay, which is notorious for being involved in landslides. The Suffolk Coast and Heaths AONB is an Area of Outstanding Natural Beauty in Suffolk, England. Suffolk Wildlife Trust (SWT) describes itself as the county's "nature charity – the only organisation dedicated wholly to safeguarding Suffolk's wildlife and countryside." It is a registered charity, and its headquarters is at Brooke House in Ashbocking, near Ipswich. It was founded in 1961, and is one of 47 wildlife trusts covering the Great Britain and Northern Ireland. As of March 2017, it has 13,200 members, and it manages 3,120 hectares of land in 60 nature reserves, most of which are open to the public. It had an income of £3.9 million in the year to 31 March 2017. Westleton is a village and civil parish in the English county of Suffolk. It is located 4 miles (6 km) north of Leiston and 5 miles (8 km) north-east of Saxmundham near the North Sea coast. The village is on the edge of the Suffolk Sandlings, an area of lowland heathland. The village lies along the B1125 road, 2 miles (3 km) to the east of the A12 and Darsham railway station. Eastbridge is a village in the English county of Suffolk. It is located approximately 4 miles (6.4 km) north of Leiston, 2 miles (3.2 km) from the North Sea in the parish of Theberton, immediately south of the Minsmere RSPB reserve. It borders the Minsmere River which cuts through an area of drained and undrained wetland known as the Minsmere Level. Havergate Island is the only island in the county of Suffolk, England. It is found at the confluence of the River Ore and the Butley River near the village of Orford. It is a marshy nature reserve run by the Royal Society for the Protection of Birds (RSPB) and is known for its population of avocets and terns. It is part of the ecologically important Alde-Ore Estuary and has protected conservation status as part of a national nature reserve, SSSI, SAC, SPA, Ramsar Site and is also a part of the Suffolk Coast and Heaths AONB. Ham Wall is an English wetland National Nature Reserve (NNR) situated 4 kilometres (2.5 mi) west of Glastonbury on the Somerset Levels and managed by the Royal Society for the Protection of Birds (RSPB). Since the last Ice Age, decomposing plants in the marshes of the Brue valley in Somerset have accumulated as deep layers of peat that were commercially exploited on a large scale in the twentieth century. Consumer demand eventually reduced, and in 1994 the landowners, Fisons, gave their old workings to what is now Natural England, who passed the management of the 260 hectares Ham Wall section to the RSPB. North Warren RSPB reserve is a nature reserve run by the Royal Society for the Protection of Birds (RSPB) in Suffolk, England. It lies on the Suffolk coast on the north edge of the town of Aldeburgh and to the south of Thorpeness and includes the Aldringham Walks area of heathland to the north. It is within the Suffolk Coast and Heaths Area of Outstanding Natural Beauty (AONB) and the Suffolk Heritage Coast area. Noted for its populations of Eurasian bittern, European nightjar and other bird species, it covers a range of coastal habitats and is protected with SSSI, SPA conservation status. The A1095 road is an A road in the English county of Suffolk. It runs from Southwold on the North Sea coast to the A12 London to Great Yarmouth road at Henham between Blythburgh and Wangford. It is around 4 miles (6.4 km) in length and is single carriageway throughout. The entire length of the road lies within the Suffolk Coast and Heaths Area of Outstanding Natural Beauty. Dunwich Heath is an area of coastal lowland heath just south of the village of Dunwich, in the Suffolk Coast and Heaths AONB. It is adjacent to the RSPB reserve at Minsmere. It lies within the area of the Minsmere-Walberswick Heaths and Marshes Site of Special Scientific Interest, Special Area of Conservation and Special Protection Area. Blaxhall Common is a nature reserve in the parish of Blaxhall in the Suffolk Coastal district of Suffolk. The reserve is owned by Blaxhall Parish Council and managed by Suffolk Wildlife Trust. It is designated a 45.9 hectare biological Site of Special Scientific Interest as Blaxhall Heath. It is part of the Sandlings Special Protection Area under the European Union Directive on the Conservation of Wild Birds, and of the Suffolk Coast and Heaths Area of Outstanding Natural Beauty. A Bronze Age bowl barrow is a Scheduled Monument. Dingle Marshes is a 93 hectares wildlife reserve on the North Sea coast of the English county of Suffolk. The reserve is located between Dunwich and Walberswick, approximately 4 miles (6.4 km) south-west of Southwold. The marshes make up part of the Suffolk Coast National Nature Reserve along with reserves at Walberswick and Hen Reedbeds. They are owned jointly by the RSPB and Suffolk Wildlife Trust and are managed by these two organisations and Natural England. The site is in the Dunwich Heaths and Marshes Nature Conservation Review site, Grade I, the Minsmere-Walberswick Ramsar internationally important wetland site, the Minsmere to Walberswick Heaths and Marshes Special Area of Conservation, and the Minsmere-Walberswick Special Protection Area under the European Union Directive on the Conservation of Wild Birds. Dunwich Forest is an area of forest and lowland heath around 1 mile (1.6 km) north-east of the village of Dunwich in the English county of Suffolk. The forest covers an area of around 9 square kilometres and was originally planted by the Forestry Commission. The forest is within the Suffolk Coast and Heaths Area of Outstanding Natural Beauty and is in the area known as the Suffolk Sandlings. 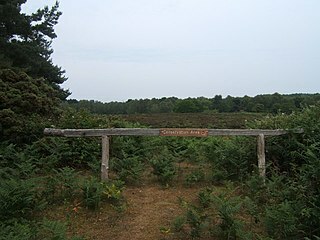 South of the reserve is the National Trust property of Dunwich Heath, one of the largest remaining areas of lowland heath on the Suffolk coast, and the RSPB reserve at Minsmere. To the north and east of the forest are Dingle Marshes, part of the Suffolk Coast National Nature Reserve. Sizewell Marshes is a 105.4 hectare biological Site of Special Scientific Interest adjacent to Sizewell in Suffolk. It is in the Suffolk Coast and Heaths Area of Outstanding Natural Beauty, and is part of a 144 hectare nature reserve managed by the Suffolk Wildlife Trust as Sizewell Belts. 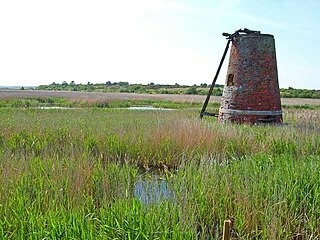 Hen Reedbeds is a 55 hectare nature reserve near the North Sea coast of the English county of Suffolk. The reserve is located in the Blyth valley between Reydon and Blythburgh, approximately 2.5 miles (4.0 km) west of Southwold. The marshes make up part of the Suffolk Coast National Nature Reserve along with reserves at Walberswick and Dingle Marshes. 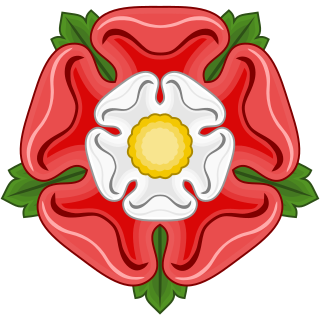 Suffolk Coast National Nature Reserve is a wildlife reserve on the North Sea coast of the English county of Suffolk. It is located around the village of Walberswick to the south of the town of Southwold. The reserve was designated in 2003, combining the existing Walberswick National Nature Reserve with reserves at Dingle Marshes and Hen Reedbeds to create a 1,340 hectares reserve. 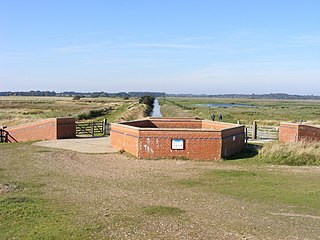 Minsmere–Walberswick Heaths and Marshes are a Special Area of Conservation and Site of Special Scientific Interest in the English county of Suffolk. The site is located on the North Sea coast between Southwold and Sizewell, extending over an area of coastline around 7 miles (11 km) in length. The site is also designated as a Special Protection Area, part of the Minsmere–Walberswick European Marine Site and contains areas designated as Ramsar sites and Natura 2000 sites. It lies within the Suffolk Coast and Heaths Area of Outstanding Natural Beauty and is made up of a "complex mosaic" of marshes, reed beds, shingle banks and lowland heath habitats. Leiston - Aldeburgh is a 534.8 hectare biological Site of Special Scientific Interest which stretches from Aldeburgh to Leiston in Suffolk. Part of it is The Haven, Aldeburgh Local Nature Reserve, and another area is the North Warren RSPB nature reserve. There is also a prehistoric bowl barrow on Aldringham Common, which is a Scheduled Monument. The site is in the Sandlings Special Protection Area under the European Union Directive on the Conservation of Wild Birds, and the Suffolk Coast and Heaths Area of Outstanding Natural Beauty. Herbert Ernest "Bert" Axell MBE was a British naturalist and conservationist who came to prominence through his wardenships and innovations at Royal Society for the Protection of Birds (RSPB) reserves. ↑ "Minsmere - Walberswick". Ramsar Sites Information Service. Retrieved 25 April 2018. ↑ "SMP7 Summary Minsmere and Sizewell" (PDF). Suffolk Coastal and Waveney District Councils. Retrieved 18 November 2017. ↑ Brooks, Susan M (2010). Coastal change in historic times–linking offshore bathymetry changes and cliff recession in Suffolk (PDF). The Crown Estate. p. 4. ISBN 978-1-906410-21-6. ↑ Axell & Hosking (1977) pp. 19–21. 1 2 3 Axell & Hosking (1977) p. 22. ↑ "Minsmere". Domesday book online. Retrieved 19 October 2017. 1 2 "Minsmere". Open Domesday. Archived from the original on 13 May 2014. Retrieved 19 October 2017. ↑ "Leiston Abbey (first site) with later chapel and pill box". Historic England. Retrieved 13 November 2017. ↑ "Leiston Old Abbey Chapel". Suffolk Archaeology. Retrieved 14 November 2017. ↑ "Minsmere peat cuttings, of at least 12th century date". Suffolk Heritage Gateway. Retrieved 19 October 2017. ↑ Good & Pluviez (2007) p. 15. ↑ "Medieval battery 1485–1540". Suffolk Heritage Gateway. Retrieved 19 October 2017. ↑ White (1855) p. 505. 1 2 Axell & Hosking (1977) p. 25. ↑ "Coastal levels". Suffolk County Council. Retrieved 19 October 2017. ↑ Good & Pluviez (2007) p. 30. ↑ White (1855) p. 308. 1 2 3 4 Flint, Brian (1979). Suffolk Windmills. Woodbridge: The Boydell Press. pp. 96–100. ISBN 0-85115-112-4. ↑ "Eastbridge Windpump". Museum of East Anglian Life. Retrieved 5 December 2018. ↑ Dolman, Peter (1978). Windmills in Suffolk. Ipswich: Suffolk Mills Group. pp. 35, 51–52. ISBN 0-9506447-0-6. ↑ "Minsmere archaeology and history". RSPB. Retrieved 19 October 2017. ↑ Sommers, Mark (2015). World War II Uncovered (PDF). Suffolk County Council Archaeological Service. pp. 14–19. Retrieved 22 November 2017. 1 2 3 4 5 6 7 8 9 10 11 12 13 14 15 16 17 18 19 20 21 22 23 24 Rowlands, Adam (2017). "Great bird reserves: RSPB Minsmere". British Birds. 110 (8): 435–455. ↑ Polak, Marcin (2006). "Booming activity of male Bitterns Botaurus stellaris in relation to reproductive cycle and harem size" (PDF). Ornis Fennica. 83: 27–33. ↑ Tyler, G A; Smith, K W; Burges, D J (1998). "Reedbed management and breeding bitterns Botaurus stellaris in the UK". Biological Conservation. 86 (2): 257–266. doi:10.1016/S0006-3207(97)00174-2. ↑ "SPA description Minsmere – Walberswick". Joint Nature Conservation Committee. Retrieved 12 November 2017. ↑ "Designated and Proposed Ramsar sites in England". Joint Nature Conservation Committee . Retrieved 21 October 2017. ↑ "Minsmere to Walberswick Heaths and Marshes". Joint Nature Conservation Committee. Retrieved 21 October 2017. ↑ "SSSI units for Minsmere-Walberswick Heaths and Marshes". Natural England . Retrieved 21 October 2017. ↑ "Suffolk Coasts and Heaths Area of Outstanding Natural Beauty (AONB)" (PDF). East Suffolk Council. Retrieved 21 October 2017. ↑ "Suffolk Heritage Coast". Natural England. Archived from the original on 4 September 2012. Retrieved 21 October 2017. ↑ "Minsmere – How to get here". Royal Society for the Protection of Birds. Retrieved 21 October 2017. ↑ "Suffolk Coast and Heaths Path". Long Distance Walkers Association . Retrieved 21 October 2017. ↑ "Sandlings Walk". Long Distance Walkers Association. Retrieved 21 October 2017. ↑ "About Minsmere". RSPB. Retrieved 21 October 2017. ↑ Ausden, Malcolm; Hawkins, Ian; Horner, Robin; Kemp, Mel; Needle, Andy; Rowlands, Adam; Sills, Norman (2005). In search of the blå bård (blue border): report of visits to southern Sweden and Denmark to investigate the grazing of reedbed margins (PDF). RSPB. pp. 1–28. Retrieved 22 November 2017. ↑ Owen, K M; Marrs, R H (2000). "Creation of heathland on former arable land at Minsmere, Suffolk, UK: the effects of soil acidification on the establishment of Calluna and ruderal species". Biological Conservation. 93 (1): 9–18. doi:10.1016/S0006-3207(99)00118-4. ↑ Ausden, Malcolm; Kemp, M (2005). "Creating acid grassland by sheep grazing and natural reversion at Minsmere RSPB Reserve, Suffolk, England". Conservation Evidence. 2: 18–20. ↑ Ausden, Malcolm; Kemp, M (2005). "Creating acid grassland by adding sulphur, bracken Pteridium litter and heather Calluna cuttings at Minsmere RSPB Reserve, Suffolk, England". Conservation Evidence. 2: 21–23. ↑ Ausden, Malcolm; Kemp, M (2005). "Creating acid grassland by adding sulphur and re-seeding at Minsmere RSPB Reserve, Suffolk, England". Conservation Evidence. 2: 13–15. ↑ Holt, Chas and the Rarities Committee (2017). "Report on rare birds in Great Britain in 2016". British Birds. 110 (10): 562–631. ↑ Hudson, Nigel and the Rarities Committee (2015). "Report on rare birds in Great Britain in 2014". British Birds. 108 (10): 565–633. ↑ Hudson, Nigel and the Rarities Committee (2012). "Report on rare birds in Great Britain in 2011" (PDF). British Birds. 105 (10): 556–625. ↑ "Guidelines for the control of mink for water vole conservation" (PDF). Berkshire Buckinghamshire and Oxfordshire Wildlife Trust. Archived from the original (PDF) on 15 April 2016. Retrieved 24 October 2017. 1 2 Wotton, Simon; Brown, Andy; Burn, Alastair; Dodd, Andrew; Droy, Nick; Gilbert, Gillian; Hardiman, Nick; Rees, Sue; White, Graham; Gregory, Richard (2009). "Boom or bust – a sustainable future for reedbeds and Bitterns?" (PDF). British Wildlife. 20 (5): 305–315. ↑ Moore, David; M Nauta, Marijke; Evans, Shelley E; Rotheroe, Maurice (2008). Fungal Conservation: Issues and Solutions. British Mycological Society Symposia. 22. Cambridge University Press. pp. 149–150. ISBN 978-0-521-04818-7. ↑ "Seasonal highlights". RSPB. Retrieved 23 October 2017. ↑ "History of the Suffolk Coast" (PDF). Suffolk Coastal District Council and Waveney District Council. Retrieved 23 October 2017. ↑ Elliott, Craig; Lohoar, Grant (2011). "Dunwich Heath and Minsmere" (PDF). Environment Agency. Retrieved 22 November 2017. ↑ "Sizewell C new nuclear power station, Suffolk". RSPB. Retrieved 25 October 2017. ↑ "Response to the Second Stage Consultation of the Proposed Development of Sizewell C Nuclear Power Station" (PDF). Minsmere Levels Stakeholder Group. 30 January 2017. Retrieved 25 October 2017. ↑ Hill, Jessica (11 July 2018). "Plans for Sizewell C nuclear power station receive a setback". East Anglian Daily Times. Ipswich. Retrieved 19 November 2018. Wikimedia Commons has media related to RSPB Minsmere .